Ground-based lasers developed by the USSR decades ago — conceptually illustrated here by artist Edward L. Cooper — were capable of interfering with some U.S. satellites. Russian. Space. Lasers. That's right, Russian scientists are developing cosmic guns capable of blasting some of the half-million bits of space junk orbiting our planet into oblivion. Precision Instrument Systems — a research and development arm within the Russian space agency, Roscosmos — recently submitted a proposal to the Russian Academy of Sciences (RAS) for transforming a 3-meter (10 feet) optical telescope into a laser cannon, the RT network reported. After that, it's sizzle time. The cannon will train laser beams on pieces of orbiting detritus in low Earth orbit, heating up the bits of floating junk until they are entirely demolished, according to RT. Human-made space junk consists of discarded or broken parts of spacecraft, launch vehicles and other objects sent into space, and it comes in many sizes. Approximately half a million bits whizzing around the planet are the size of a marble or bigger, and about 20,000 of those are at least the size of a softball, NASA reported in 2013. These bits travel at speeds of up to 17,500 mph (28,164 km/h), and at such speeds, even a relatively small particle of debris could seriously damage a spacecraft or satellite. Low Earth orbit, the region of space within 1,242 miles (2,000 kilometers) of the planet's surface, is the most concentrated area for orbital debris. 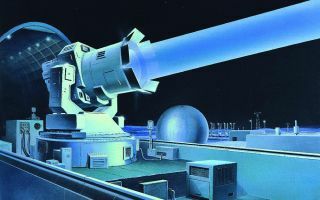 In 2015, Japanese researchers presented plans for a spacefaring, debris-blasting laser mounted on a powerful telescope intended to detect cosmic rays, Space.com previously reported. Their study described combining many small lasers to produce a single powerful beam that would vaporize matter on the surface of space junk, generating a plume that would propel the debris lower in its orbital path, eventually causing the object to burn up in Earth's atmosphere. And earlier this year, researchers in China published a report proposing another laser-based approach to dealing with space garbage; their solution also suggested using satellite-mounted lasers to nudge orbiting debris into a lower orbit. Clearly, space debris is a problem that would likely benefit from a futuristic solution like a laser cannon. However, while Precision Instrument Systems representatives confirmed the existence of their report to Sputnik, they "declined to elaborate further" on any details related to the project's production time frame or its technical requirements.